Rent figures were calculated using 699 Brookline apartments that were rented in the last year or that are currently available. Brookline Pads formulated the real time vacancy numbers by combining all of the apartments that are currently available and those that will become available in the next few months, and dividing that by the total amount of apartments for Brookline in the Boston Pads database. Population and income data was gathered from the US Census Bureau. The averages for Brookline are very similar to average rent prices in Cambridge, another close Boston suburb, if not slightly less expensive. 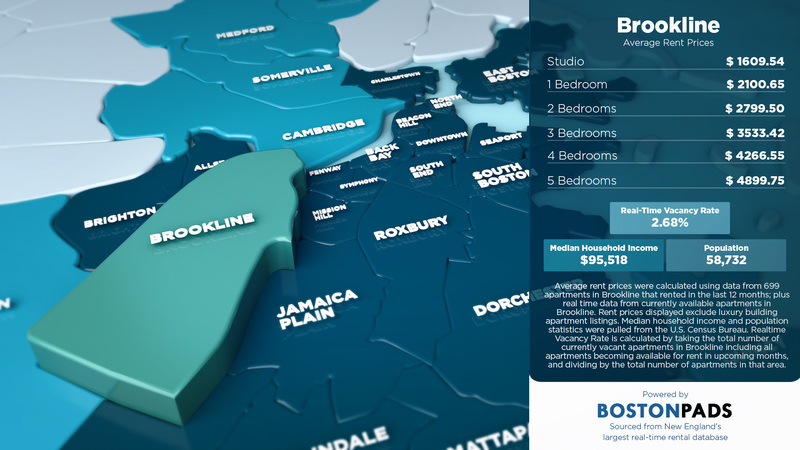 Rents in Brookline are slightly less expensive than Cambridge for studio, 1-bedroom, 2-bedroom, and 4-bedroom apartments. Compared to average rent prices in Jamaica Plain, Brookline is much more expensive. Renters in Brookline pay almost $400 more per month for a studio, $600 more for a 2-bedroom, and $900 more per month for a 4-bedroom apartment. Compared to the 22 Boston neighborhoods and greater Boston towns and cities that were sampled in this study, Brookline ranks in the top 10 for all size apartments. The town ranks 8th highest for studio apartments, 1-bedroom apartments, and 3-bedroom apartments. It ranks 7th most expensive for 2-bedroom and 4-bedroom apartments, and 5th highest for 5-bedroom apartments. Brookline Pads is powered by the Boston Pads database. Renters and landlords alike can get information like this seven days a week through a professional and courteous phone staff as well as licensed real estate agents. Landlords can get a sense of the local rental market for any neighborhood, including current rent averages, vacancy rates, trending topics, and more. Boston Pads uses this data to assist local landlords in maximizing rental income and reducing vacancy times. It is this data-driven and locally-focused approach that has helped Boston Pads amass a network of more than 16,000 landlords who use Boston Pads technology. Landlords who list with Boston Pads ensure themselves the best marketing coverage from one source. Boston Pads listings are syndicated to nearly every national platform including Zillow, Craigslist, and Trulia, over 80 locally optimized real estate listing websites, and 100+ geographically targeted social media pages on Facebook, Twitter, and YouTube. By combining the most comprehensive marketing with the latest data, Boston Pads has positioned itself as the real estate and information technology leader in New England. Their platform is scalable and adaptable to any market, and can be used by any agency or landlord to gain access to marketing and real estate tools to help gain an edge on their competition.